President Ibrahim Mohamed Solih stated on Sunday that development is slow despite economic progress due to the unwillingness for decentralisation. Speaking at the Local Council National Symposium held in Hotel Jen, with 18 council presidents and women’s empowerment committees from various islands in attendance, President Solih highlighted several issues with the local council system. Talking about the importance of granting local councils the power to operate independently for the development of the island, President Solih insisted that introducing councils and electing councillors are not a solution if the councils do not possess administrative and financial empowerment. He stressed that decentralisation is not renaming the island office to the secretariat of island council. President Solih went on to say that an ideal decentralisation system would allow the residents to decide how to operate their island or city. He acknowledged that the Maldivian people wanted to grasp the horizon of development at a fast rate. “We are here to empower councils to reinforce a properly decentralised Maldives. To provide the complete island life.” President Solih assured. The President also declared that the direction of development has to be altered immediately, considering the economic developments and increasing population of the Maldives. If not, he theorized that 60 percent of the population would be living in capital Male’ by the year 2050. Speaking of how the Decentralization Act has now been in place for almost a decade, President Solih highlighted the challenges facing the implementation of the National Regionalisation and Decentralisation Programme. He noted that Maldives had only reached adequate decentralisation politically, and was lacking it in other important areas. Furthermore, President Solih emphasized that a decentralisation policy that fails to empower women is not a proper decetralisation policy. Noting ways in which the decentralisation act could be implemented more successfully, the President insisted that the involvement of local councils in development projects would ensure faster progress, and would also lead to suggestions from the public factoring into the projects. Additionally, President Solih advised against removing and suspending councillors for politically motivated reasons. He also spoke about the third amendment brought to the Decentralisation Act, proclaiming that it is contradictory with efforts for a well-established decentralisation policy. The amendment states that the authority of city councils are determined by the president after discussions with the cabinet. The amendment only allows the provision of services based on the permissions given by a higher authority. “What power do the councils have? What choice do the councils have? When the council’s powers are stripped away by a centralized government, isn’t the role of the councils meaningless? 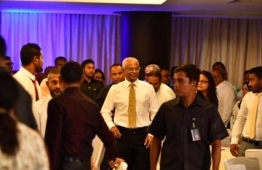 This is not how the decentralization policies I know works”, President Solih said. The President noted that there were many contradictory laws when the Decentralisation Act came into effect. He guaranteed to make amendments to these laws to perfect the decentralisation scheme.